Take a trip to Mulberry Lane today, Cherry Guidry's new holiday collection. These scenic fabrics are so adorable that you'll want to move right in! We asked Cherry to tell us about Mulberry Lane. What inspired the Mulberry Lane collection? When my children were young, we lived in a town with a quaint little street called Mulberry Lane. These homes were decked out to the max for the holidays, and it was one of our favorite roads to visit around Christmas. There’s the little street scene with all the cars. I love the street, the movement going on, and all the snowflakes. 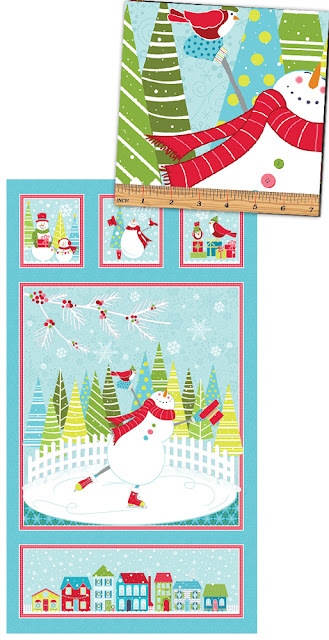 I also love the holiday fun print—it has the little bubbles with scenes in them. I really love what happened with the blenders in this collection. There are six different colors, and they works so well for applique. Plus, these can stretch into the entire winter season, not just Christmas. How did you come up with your palette? Of course we had to bring the aqua back—I started with a deeper turquoise that you see in the snowflakes. There’s also a darker blue in here. I love the non traditional holiday colors, but I still wanted to include red and green. I love the way the lime works with the bright red. Can you talk about the patterns you’ve designed using Mulberry Lane? First there’s the Mulberry Lane quilt, a good sized throw. It’s all applique; blown up versions of the houses, cars and scenes in the fabric. I especially love the little row of cars at the bottom. All my patterns are available with SVG files, so if anyone wants to cut the applique pieces that way, they can. Snow Crystal—I love stylized shapes, and this snowflake is no exception. It could be Christmas-y, but depending on the palette, it can work all through the winter. I love the open space ready for fabulous free motion quilting. With Winter Star, I wanted to include more piecing. 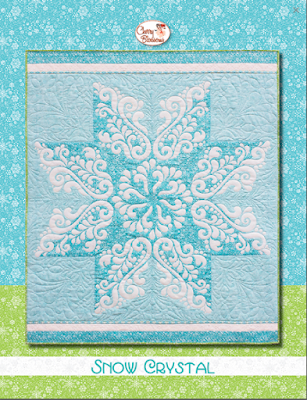 In the center of each block is an appliqued snowflake. There are two sizes—one bed-sized, and the other more of a throw. 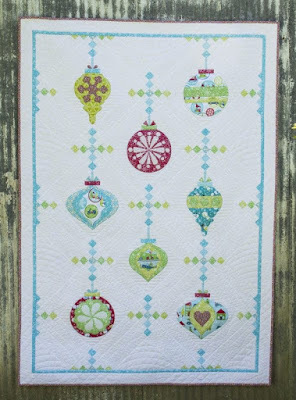 I have the vintage ornament quilt along on we all sew. I’m also doing a quilt along on Bernina’s Blog, We All Sew. It’s called the Vintage Ornament Quilt. The idea came from playing with an Irish Chain design. I wanted to see how I could include applique in with some type of simple chain. I have four more blocks to post (one each month), so there’s plenty of time to join in. At the end, I’ll talk about how to quilt it. Thanks, Cherry! 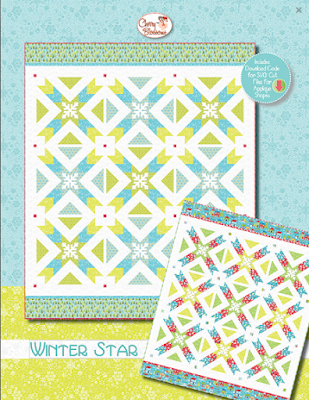 Cherry has offered to give away three free patterns (Mulberry Lane, Snow Crystal, and Winter Star). For a chance to win one of these patterns, leave a comment below letting us know which fabric you like best in her collection and why. Giveaway open through Monday, July 24th at 11:50 pm EDT. 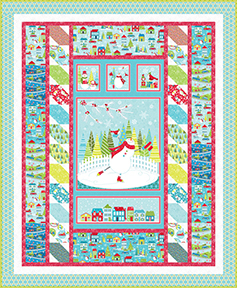 We also have a free quilt pattern available on our website, Snowy Village, using the panel from Cherry's collection. Click here to see the entire Mulberry Lane collection. 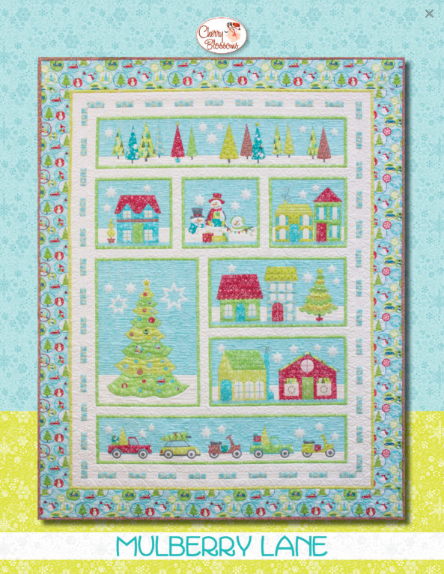 Click here to visit Cherry's website, and find her patterns and blog. I really like the Mulberry Lane Circle Dots in Dark Blue, so many things you could do with it, not just Christmasy things. I love the Holiday Fun in white. It looks like snow globes and has so many opportunities for fussy cutting! I like the Holiday Fun in white best. You could really get creative with fussy cutting. 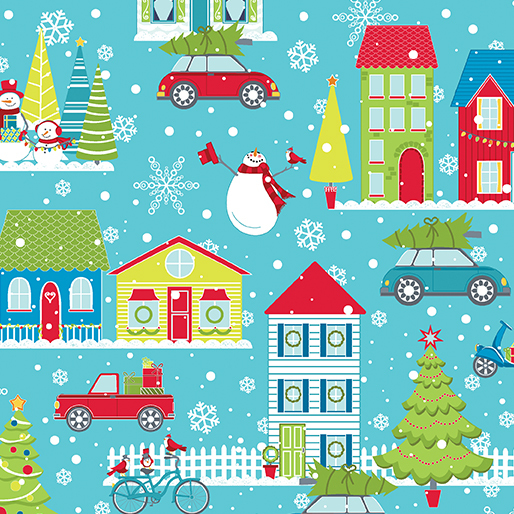 I love the Holiday Fun print . Would be great for fussy cutting I think. 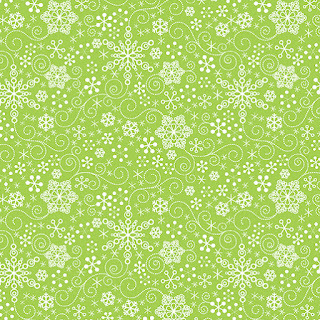 I'm always a sucker for snowflake fabric. I really love them on the red. But all of that collection is super cute. Oh my, hard to choose a favorite! I am drawn to tree and leaf prints though, so I'll choose the Christmas trees on the blue background. This is such a great fabric collection! The colors are different that the traditional Christmas colors and that is so appealing to me! My favorite is Mulberry Lane Snowman Red. 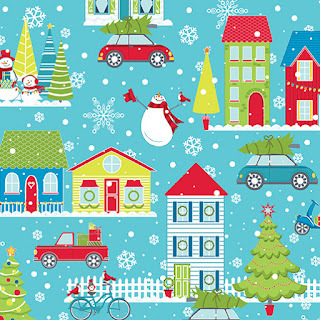 I've always loved snowmen and this fabric could work for me all winter season long! My favorite is the snowflake in white fabric. 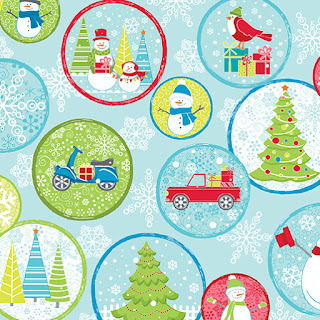 Love snowmen, but someone just mentioned snow globes and the white snow fabric is perfect for a globe. 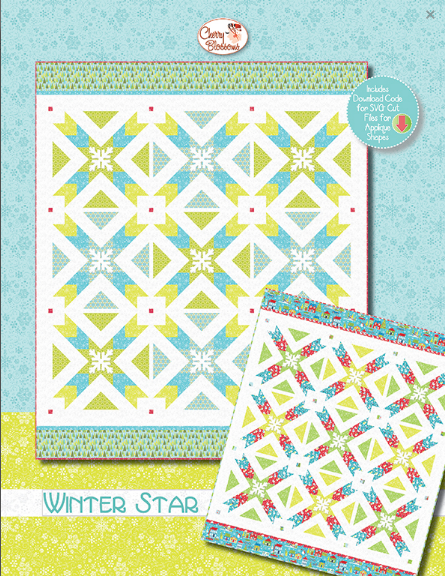 I really like Winter Star which could be a winter long quilt. Mulberry Star Geo in White/Turquoise is my favorite! It is such a magnificent detailed fabric that will work so beautifully in a number of my favorite quilt blocks to turn into Christmas Quilts. Yet, the whole fabric line is fabulous and will make such beautiful and fun quilts! My favorite is the trees with blue background. I really like the whole line. 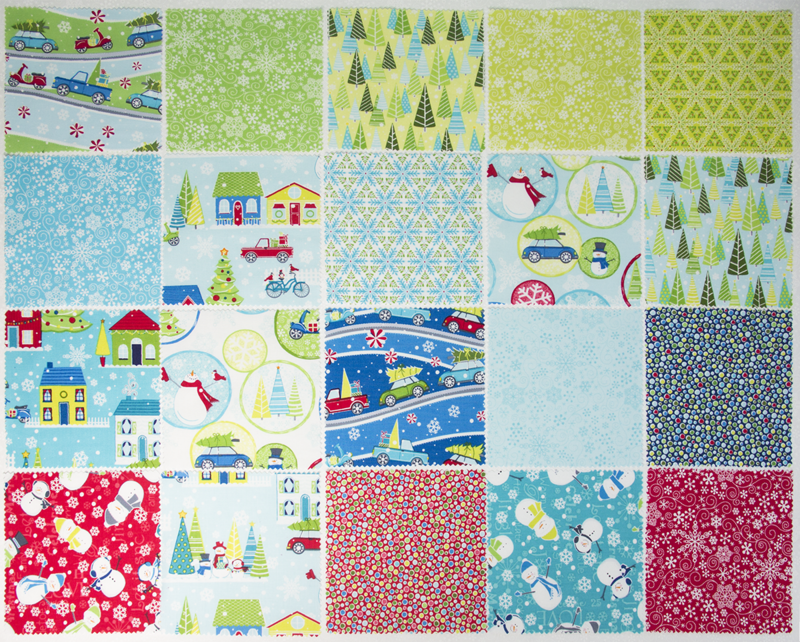 I see a Christmas quilt in my near future. I am torn between the snow globes and the panel. Both are so full of fun and energy. I love the street scene with the cars. It is nostalgic, and brings back lovely memories for me. I love Christmas! Your fabric is adorable. I love red, so I would choose the snowflakes in red. I like the MulberryLane Circledots in dark blue. It is festive and a nice twist on red and green. Such cute fabric!!! I really like them all, but if I had to pick one--I like the one with the cars and houses! All the collection is fabulous.If I have to pick only one would be Mulberry Lane Snowflake LtTurq . I am a tree lover so the trees in Mulberry Lane would be my fav! I love the bubbles snow globes!! I like the Snowman Panel. I love them all but really like Mulberry Holiday Fun in Light Turquoise! Thanks for the opportunity. I like the snowflake blenders. They are appropriate 9 months of the year where I live (Alaska)! I like all of them but the street scene is really a lot of fun. The entire Mulberry Lane collection is so beautiful. The moment my mind drifted down memory lane as I examined each bubble in Mulberry Holiday Fun, I knew I'd found my favorite design. The bubble with the big and little snowmen reminded me of time spent with my grandpa when I was a child. And there's me in another bubble with my arms in the air embracing the first snowfall of the season. Then there are the groupings of Christmas trees grandpa planted for me just past the barn near the road, I can still smell the needles from the trees and faint scent of oak coming from the fireplace . 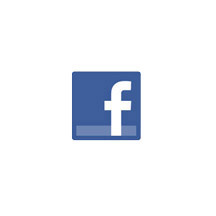 With each new bubble image, a new memory bubble appears. And of course being a fifth generation quilter, I can hear my grandmother child you'd better get busy if you're to finish that quilt before Christmas. Thank you for designing such a beautiful line for this season and the trip down memory lane via Mulberry Holiday Fun. 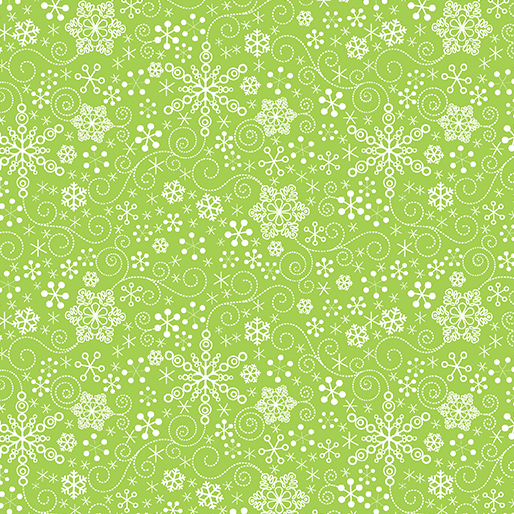 THAT green with snowflakes is wonderful! I remember when I was using lots of 30's fabrics and looking for THAT green. It wasn't the same as the delightful greens of today that I just love. I really like the Mulberry Lane Circle Dots. This is special to me as I grew up in a town with the same name. I like the dark turquoise street scene and the dark blue circle dots. MULBERRY HOLIDAY FUN WHITE is my favorite! Such a sweet print with what I think are many fussy cuts! Loving all the SNowflake prints, especially Lime, and lt and dark turquoise. As Cherry says, they can stretch well into the winter season with out looking Christmas-y. Thats what I like about the snowflake prints. I do believe Mulberry Lane will addthe Winter themed quilt to my home. Thank you.